If you’re ever riding a train in Japan’s Tottori prefecture, you might be lucky enough to ride the “Conan Train.” Which, as it happens, is exactly the same as a regular train, except for the fact that the outside is a giant advertisement for the “Conan” anime (that’s “Case Closed” in America). Why, you might ask, is there such an over-the-top advertisement for an anime in the middle of Japan’s least populous prefecture? Surely the advertisement would reach more people in Tokyo? As it happens, Tottori prefecture is the home of Gosho Aoyama, the author and illustrator of the Conan manga. Thus, it’s not that someone is advertising the anime or manga. Rather, the prefecture itself is advertising it’s connection to the series, in hopes of drawing fans out to the countryside for a vacation. Interstingly, this marketing strategy is quite common around Japan. 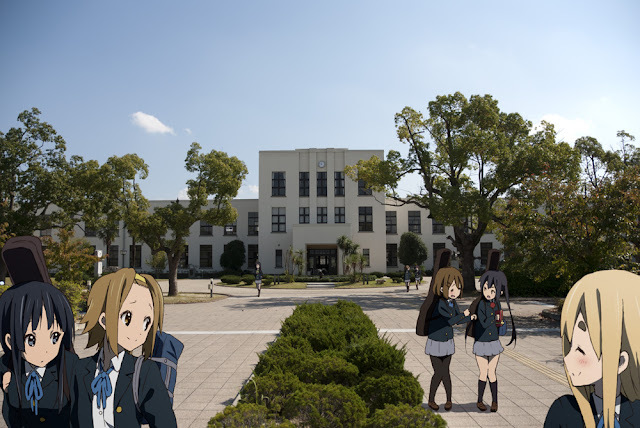 For example, the school that appears in the K-On anime was actually based on Toyosato Elementary School in Shiga Prefecture. Like Tottori, Shiga is largely a rural prefecture, and Toyosato in particular is relatively close to Hikone Castle (arguably Shiga’s most famous tourist destination) so it stands to reason that the town would want to provide a reason for tourists to vist there as well. What I find particularly interesting here is how the “advertising” in Japan differs from that in the US. In America, I think that if an animated character is going to be used for advertising, it will be to sell a particular product. Take a quick walk through your local supermarket and you’ll see famous cartoon characters plastered on everything from cereal boxes to holiday cards. On the other hand, Japan seems to use characters to promote places by mapping locations and events from a series on to the real world. I suppose in that sense you could say that the place has become yet another product, which is an interesting concept, though I’m not really sure what that means for Japanese society as a whole. In America, I think that if an animated character is going to be used for advertising, it will be to sell a particular product…On the other hand, Japan seems to use characters to promote places by mapping locations and events from a series on to the real world. What do you think? Is it good to commodify a place for the sake of tourism? What problems could it cause? Leave a comment or send me an email if you have any ideas.